Ernest was scheduled to be executed on December 6, 2002, at 2:00 a.m. All executions are scheduled for 2:00 a.m. in North Carolina. Urban legend is that this early morning hour was designated long ago to limit inmate unrest, as well as public demonstration. Maybe so, but the late hour is brutal on those involved in an execution, especially the witnesses and the family and friends of the inmate. For those trying to stop the execution, exhaustion mixes with hope to stave off despair. It is not yet officially winter, but the Triangle is bracing for its first brush with icy weather today and Thursday. Forecasts call for snow and sleet starting by mid-afternoon, changing to a mix of sleet and freezing rain tonight. The storm could produce a quarter-inch of ice or more on roads by Thursday morning, when more rain or freezing rain is expected. “Great,” I said sarcastically as I recalled my execution mantra: expect the unexpected and roll with it. My mind began to ponder the possible scenarios. What would it take for the State of North Carolina to call off the execution? Maybe the Executioners won’t be able to get to the prison? Then a panic set in. What if I can’t get to the prison? What if my co-counsel, John and Matthew who live even further away, can’t get there? And what about Ernest’s family? Eight of his nine brothers and sisters, along with nieces and nephews, planned on being at the prison for their first contact visit with Ernest in a decade. They would be devastated if they were unable to tell Ernest goodbye, as would I. It was raining when I went to bed early on December 4th. I was awoken in the middle of the night by the sound of tree limbs breaking and transformers blowing. Our electricity had gone out. I snuggled closer to Pat in bed and tried not to think what the next 24 hours might bring. When I woke again, the sun had risen. I blew into the air and saw my breath. I sat up, looked out the window, and saw a winter wonderland. Everything in sight was covered with ice. Pat went downstairs to turn on the gas fireplace and stove to give us a little relief from the arctic air. I checked my cell phone. No service. I could not communicate with my co-counsel, the prison or Rose. All I knew to do was to strike out for the prison. Thanks to a gas water heater, I was able to take a hot shower before putting on layers of clothing. I pulled on my hiking boots and carefully slid to the car. Pat stayed behind to care for his elderly mother and our dogs. My slow 30 mile trek to the prison took me through a surreal white landscape. 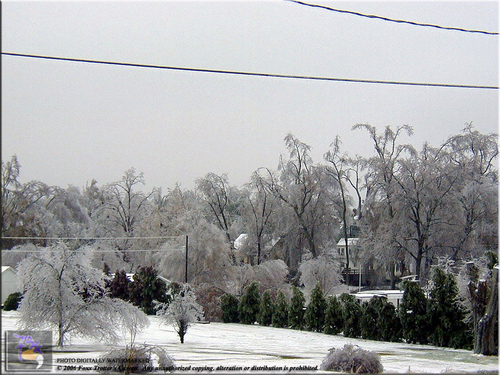 Those trees that were not snapped into pieces were arched to the ground by the weight of the ice. It was lonely on the road, which was a good thing: fewer things to hit or to be hit by. This entry was posted in Ernest Basden, My Clients, NC Death Penalty and tagged Ernest Basden, Ice Storm, prison on February 5, 2013 by Cindy@life.